Now that the cast is off my arm, and I am moving around pretty normally, we have continued our exploration of the Sierra De La Laguna Biosphere. This last weekends entry point to the reserve was on the east side of the mountain range, near the small town of Santiago https://en.wikipedia.org/wiki/Santiago,_Baja_California_Sur . 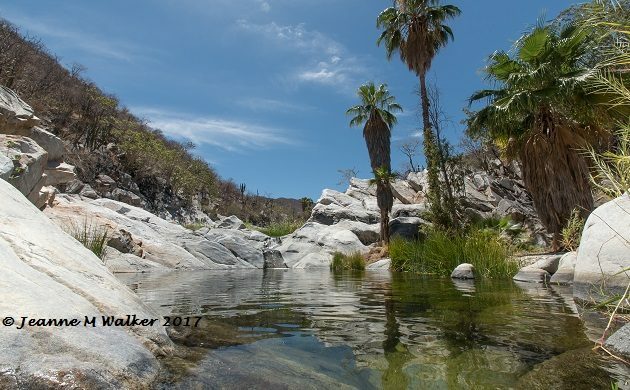 On this side of the Sierra De La Laguna mountains, there are several large canyons, three of which have year round running streams that fall down out of them. Due to the large slabs of granite, many of which are more than 100 meters across, some pretty impressive waterfalls are formed, and the subsequent pools at the bottom of them. A real bonus, especially in the cooler months, is that some of the lower tributaries that run into the canyons are geothermally heated. This has formed some incredible hot springs pools. In order to explore this area, we made the 2 hour trip from La Paz, the last 40 kilometers or so, on fairly decent, if minimally maintained, dirt roads. We climbed from sea level up to about 2000 feet of elevation, before finding the small rancho, and the local Mexican who was collecting the $3.00 US dollar fee for parking and day pass. To be honest, much of my reasoning for making the trip, besides the beauty of the area, and a nice cool swim, was an unconfirmed report of American Dippers being seen swimming in these cool, ultra clear fresh waters. I was pretty skeptical but what the heck, it would make for a great weekend. From the parking area, we reached the waterfalls, and the hot springs in about 5 minutes, on a well maintained trail. The area certainly looked much like the areas that I had seen Dippers in before. Fast moving, clear stream, with lots of exposed rocks. The one thing missing was tell tale sign, droppings at some of the more prominent rocky points. The day was approaching 96-97 F degrees, so a nice swim was called for. Once we had gotten cooled off and were relaxing on the large rock slabs, the local birds all started to appear. Scott’s Orioles, Cactus Wrens, Common Yellowthroats, Ash-throated Flycatchers, and even a rather uncommon Brown-headed Cowbird all were attracted to the cool water, and the foliage around it. Jeanne even caught me doing what I do. 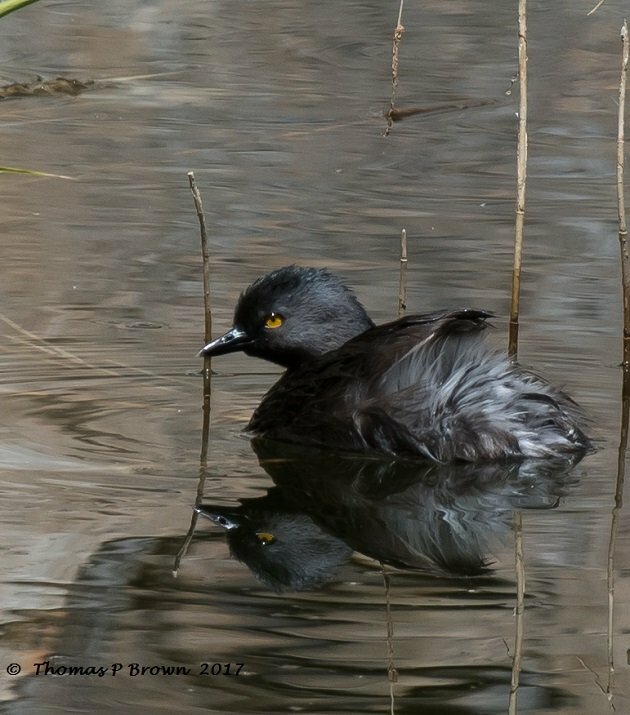 All of the sudden, out of the corner of my eye, a small black blur appeared at the waters edge, just as it dove under water. Could it be, might this really be the American Dippers that I had heard rumor of? 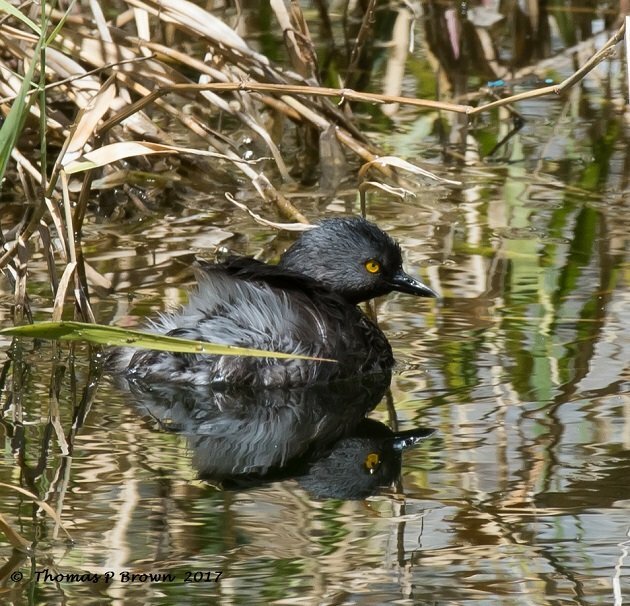 Then, up it pops, right along the side of the reeds……wait a minute, that’s a grebe! 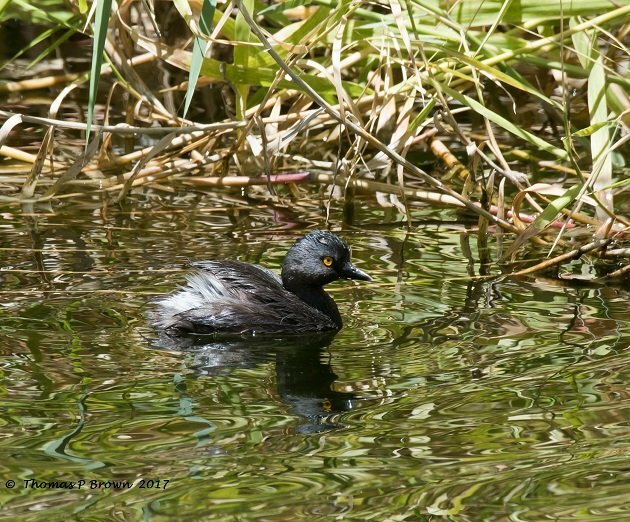 What the heck is a grebe doing way up here in the mountains? They turned out to be a pair of Least Grebes, taken up residence in this beautiful mountain oasis. 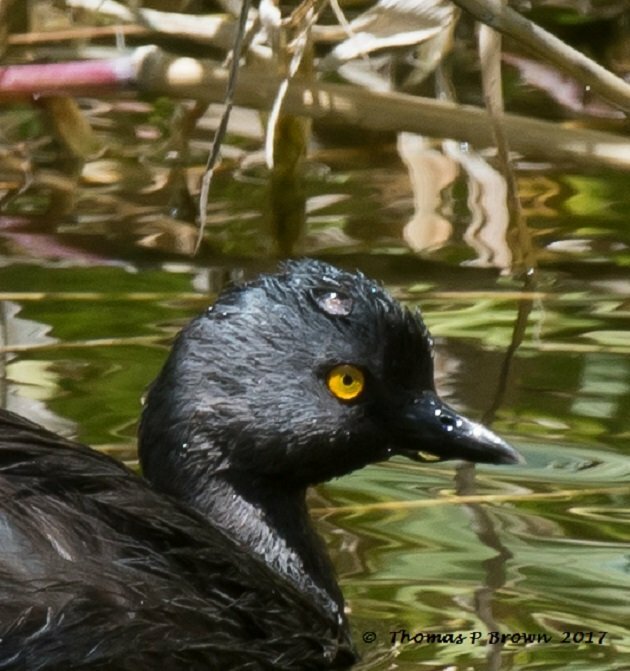 This tiny little bird, with nearly all black plumage, and a bright yellow eye, are extremely uncommon, and this is only the second sighting ever for me. 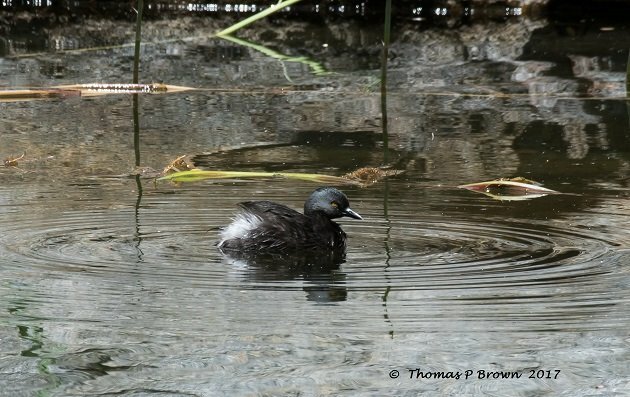 Due to their size, they are able to navigate much smaller bodies of water, so this little year round stream, never more than 5-6 feet deep seemed to work just fine for them. I have to admit, this lovely pair of diving birds have made themselves a beautiful home, one that we will be back to visit often, especially once the heat of the Mexican desert starts to climb. I stumbled upon your text and pictures and like them a lot. Christine, Thank you very much.